NOTE: The rubber ducks in this tutorial have been discontinued. The kit now contains Duck Erasers. 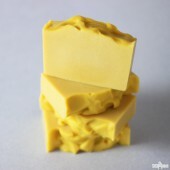 ONE: In a large heat safe container, melt 32 ounces of clear soap in the microwave. 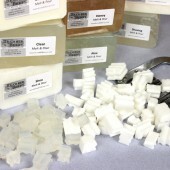 Once the soap is melted, separate the soap evenly into two containers (16 ounces in each container). 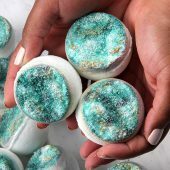 TWO: Add 9 ml of Celestial Waters fragrance oil and 50 drops of diluted Blue Green LabColor to the first batch of melted clear soap. Mix well and set aside. Unsure how to mix up your Labcolors? 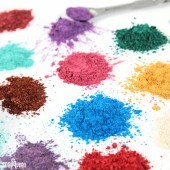 Click here to learn how to dilute your LabColors. 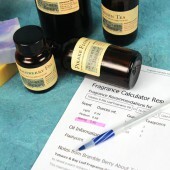 THREE: To the second batch of clear soap, add 9 ml of Celestial Waters, 20 drops of diluted Royal Blue LabColor and 30 drops of diluted Blue Mix LabColor. Mix well and set aside. 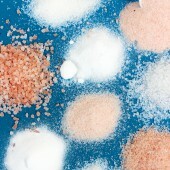 FOUR: In another large, heat safe container, melt 16 ounces of white so soap base in the microwave. 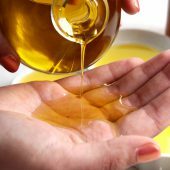 FIVE: Since the Celestial Waters fragrance oil is yellow in color, we’re only going to add 3 ml of the fragrance oil to the white soap base. We want it to stay nice and white. Leave the soap uncolored. SIX: Let all three containers of soap cool down to 130-135 degrees. Try to time it so they cool at the same time. 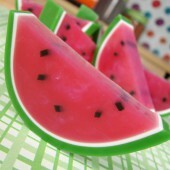 HINT: If one of the three soaps cools down first, pop it back in the microwave for 10 seconds. 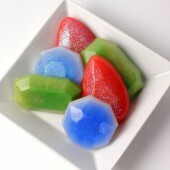 All three soaps need to be at 130-135 degrees Fahrenheit before pouring. Please note that these temperatures work with the Bramble Berry ‘house’ bases – the bulk bases and other brands will utilize different melt and set points. 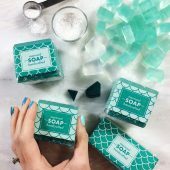 SEVEN: Once the soaps are at the ideal pouring temperature, pour a little bit of the teal soap into the mold (about 1/4 inch). 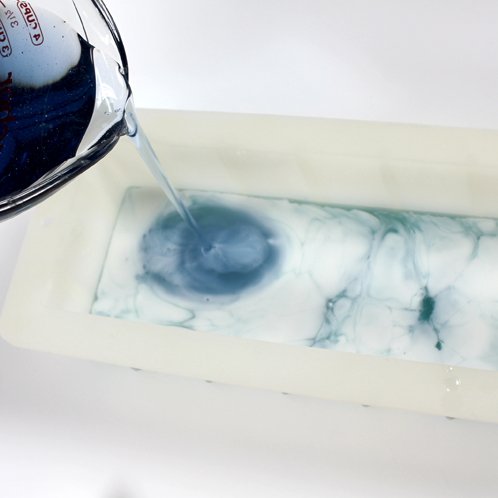 Then pour the same amount of the blue soap followed by the white soap. 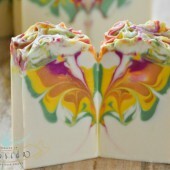 Repeat this pouring pattern, alternating soap colors. Spritz with rubbing alcohol to get rid of air bubbles along the way. 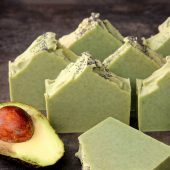 Once all of the soap is in your mold, let it cool for 4-6 hours before you carefully unmold. 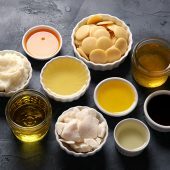 ONE: Combine 16 ounces of melted white soap base, 8 Tablespoons of Castile Liquid Soap and 6 ml of Celestial Waters fragrance oil in an electric mixer. 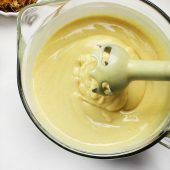 Whip the ingredients together on medium switching to high after one minute. 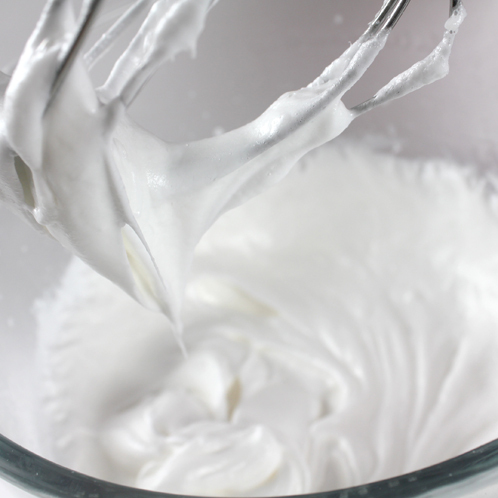 Keep mixing until the mixture forms fluffy, whipped peaks that look like frosting. TWO: Use a spatula to quickly frost the entire loaf of soap then swiftly and evenly nestle 6 rubber ducks into the fluffy frosting. HINT: I frosted what would be the “bottom” of the soap loaf, which is the top of the soap after you’re done pouring. 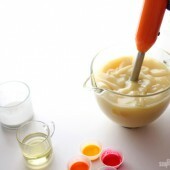 THREE: Let the frosting harden for about an hour and the ducky soap is ready to cut! Quack! Quack! 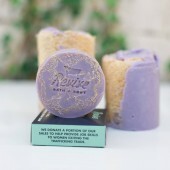 This Rubber Ducky Soaps are made by placing rubber ducky toys on each bar. 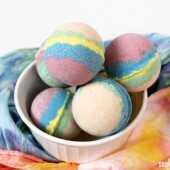 They are perfect for bath time fun! 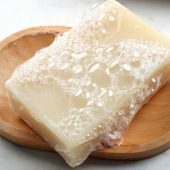 In a large heat safe container, melt 32 ounces of clear soap in the microwave. 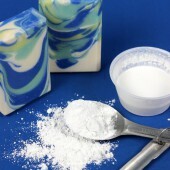 Once the soap is melted, separate the soap evenly into two containers (16 ounces in each container). 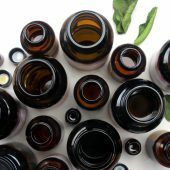 Add 9 ml of Celestial Waters fragrance oil and 50 drops of diluted Blue Green LabColor to the first batch of melted clear soap. Mix well and set aside. Unsure how to mix up your Labcolors? 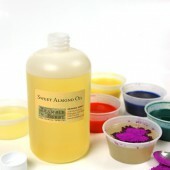 Click here to learn how to dilute your LabColors. To the second batch of clear soap, add 9 ml of Celestial Waters, 20 drops of diluted Royal Blue LabColor and 30 drops of diluted Blue Mix LabColor. Mix well and set aside. 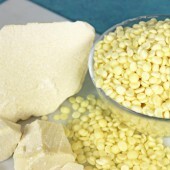 In another large, heat safe container, melt 16 ounces of white so soap base in the microwave. Since the Celestial Waters fragrance oil is yellow in color, we’re only going to add 3 ml of the fragrance oil to the white soap base. We want it to stay nice and white. Leave the soap uncolored. Let all three containers of soap cool down to 130-135 degrees. Try to time it so they cool at the same time.If one of the three soaps cools down first, pop it back in the microwave for 10 seconds. 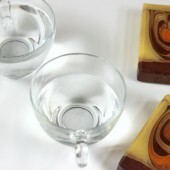 All three soaps need to be at 130-135 degrees Fahrenheit before pouring. Please note that these temperatures work with the Bramble Berry ‘house’ bases – the bulk bases and other brands will utilize different melt and set points. 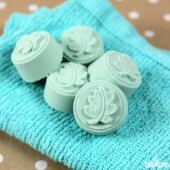 Once the soaps are at the ideal pouring temperature, pour a little bit of the teal soap into the mold (about ¼ inch). 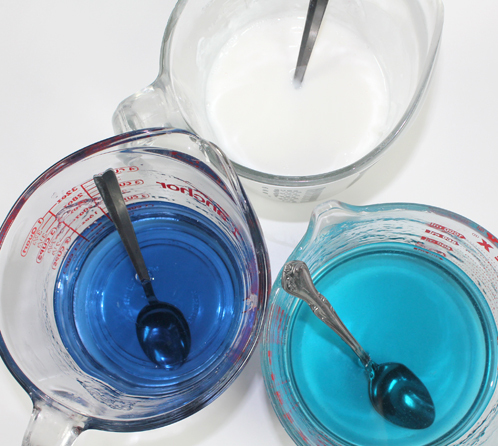 Then pour the same amount of the blue soap followed by the white soap. 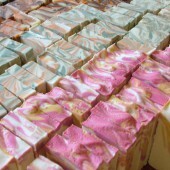 Repeat this pouring pattern, alternating soap colors. Spritz with rubbing alcohol to get rid of air bubbles along the way. 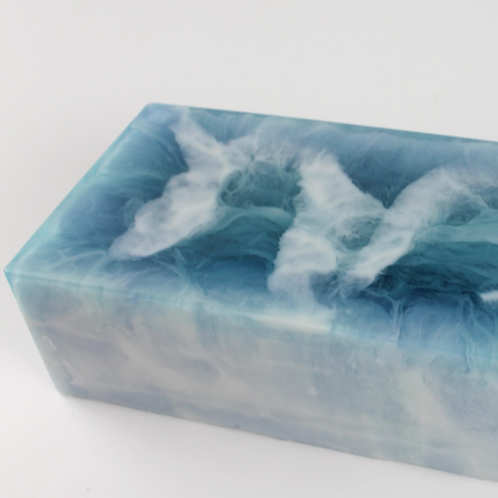 Once all of the soap is in your mold, let it cool for 4-6 hours before you carefully unmold. 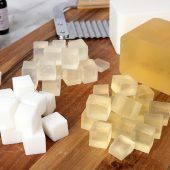 Combine 16 ounces of melted white soap base, 8 Tablespoons of Castile Liquid Soap and 6 ml of Celestial Waters fragrance oil in an electric mixer. 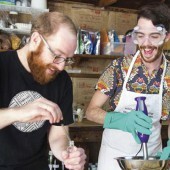 Whip the ingredients together on medium switching to high after one minute. 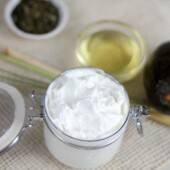 Keep mixing until the mixture forms fluffy, whipped peaks that look like frosting. Use a spatula to quickly frost the entire loaf of soap then swiftly and evenly nestle 6 rubber ducks into the fluffy frosting. Let the frosting harden for about an hour and the soap is ready to cut! Quack! Quack! Previous Post: Meet the New Bramble Berry Athletic Club! 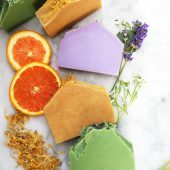 When you are pouring the 3 different soap colors do you need to wait for each “layer” to slightly harden before pouring the next? Or do you just keep alternating pours for each one. I tried this and my colors sort of all melded together and did not have the same effect as the one pictured. You could not really distinguish between each color. Would that have to do with the temperature being off? Hi. I noticed that you are using labcolour and they would bleed. So if I leave the soap there for a few weeks, would the soap all be merged into one single blue block? This is absolutely adorable! I’m going to try this out for Christmas. I have some cute little nephews that might enjoy this. Thanks for sharing! Before I put the frosting on top of the actual soap loaf, do I have to spritz it with alcohol so it will stick? Thanks. 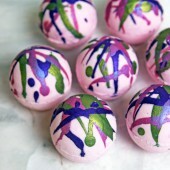 If I was to make this in CP….what colorants would i use? Keep us updated on your progress, we’d love to see how it turns out for you! 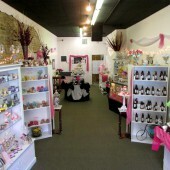 And, if you get any pictures, you can share them with us on Bramble Berry’s Facebook page. 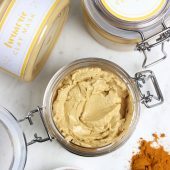 I was wondering if this type of whipped frosting would hold up in a 3D silicone cupcake mold? 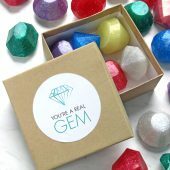 These soaps are a little trickier then normal bars to wrap, but all you need is a little bit of plastic wrap, patience and a heat gun! Can I add a little bit of meringue to this recipe or wait after a week for the fluff (I love this word) to harden. Im putting my cupcakes in a box, but a little nervous about the frosting smearing the inside…. 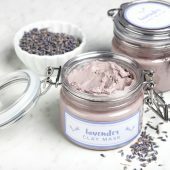 The frosting in this recipe should harden up a bit more then it is right now, so it shouldn’t smear on the inside of your packaging. I made these today — OMG they came out great .. 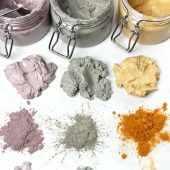 I could not believe it – I love the color combination and this project has encouraged me to try additionallab colors- I followed diluting instructions to the “t” – The smell is amazing. I really love this technique and enjoyed making this loaf today – My hubby was super impressed! 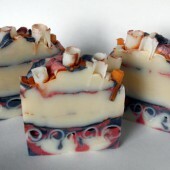 I love, love the swirl technique using M&P soap . It is so wonderful to hear that Cindy! 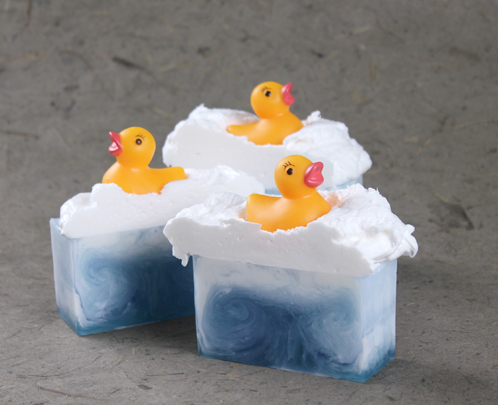 I’m glad you enjoyed making these ducky soaps, they are absolutely adorable! 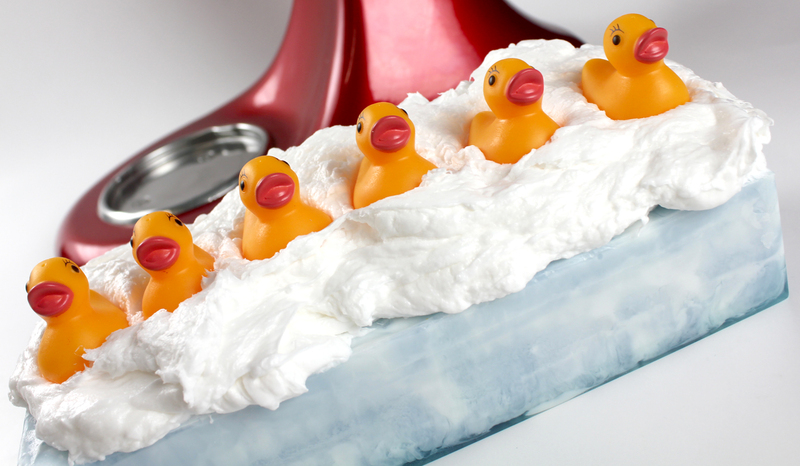 If you have pictures of your cute little ducky soaps, you should share on our Facebook page! Yes it did. thanks. I’ll do 1 loaf at a time. 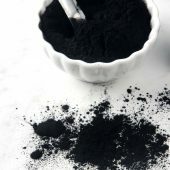 I did get labcolors, but I believe I need to dilute this. Correct? Do u think that putting soap hearts in the frosting will hold up? 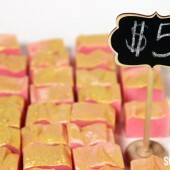 I think this will make really cute favors for a bridal shower. You are quite right about that! You do need to dilute the LabColors before you use them. 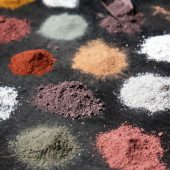 If you are having any difficulty, you can refer to this blog post on diluting LabColors. I think that soap hearts in your frosting will hold up just wonderfully and I bet they will be the cutest bridal shower favors! 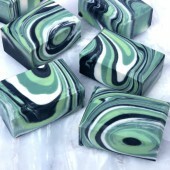 Also new to soap making. I’m going to make 4 loafs of this soap, but will put hearts in place of the ducks (bridal shower). 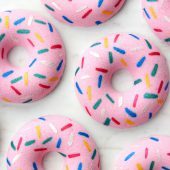 Can I wait and frost them at the same time or do I need to frost right after each loaf? I’m worried about the frosting adhering to the soap. Any suggestions? Hi Mary! The frosting will probably have a better chance of sticking to the soap if it’s fresh. That’s how we did it and it worked perfectly. You’ll probably be able to frost all 4 loaves by just doubling the frosting recipe (we had some left over). Did that answer your question? 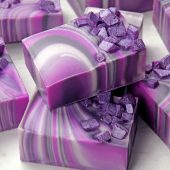 I am new to soapmaking, but am having so much fun!!! 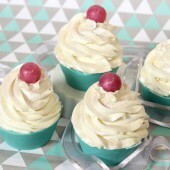 Could you use the whipped topping in this recipe with a loaf of cold process soap? Thanks. Welcome to the Soaping World Regina!! We are so happy to have you! 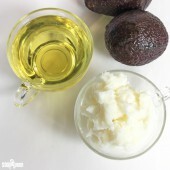 You can absolutely use this whipped topping for a loaf of cold process soap! 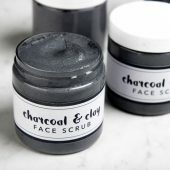 Here is another amazing tutorial for CP frosting! Tried this for the first time today and yes I will say you have to work quickly with the frosting because it sets quick. I didn’t have castile liquid soap around so I tried Dawn? To make the “topping” could you just add virgin olive oil? In my research it seems that is all castile is. I love this idea and it really did turn out great. I found that the proportion of whipped topping was far greater than what I needed for one loaf. Next time I think I will make half as much of the foam topping, or make two loaves of soap. I’m glad you had success with your project! Woohoo! The best thing about this frosting recipe is that you can save the leftovers and use again. Just melt everything back up and give it a whip when you’re ready to use it! I never even thought of that, thanks for the info. When I was making the whipped topping it reminded me so of making meringue that I forgot soap is a little more resiliant than egg whites. 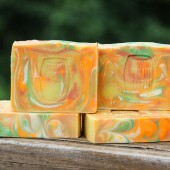 I really did have so much fun making the duckie soap and everybody has raved about it. I can’t wait to make it again!! Do you need to spritz the loaf with alcohol right before putting on the frosting. We didn’t spritz with rubbing alcohol and the frosting stayed on just fine. This technique is all the temperatures of the melt and pour base when you pour. If they are a little cooler they will not blend together (around 130 degrees). In fact, they will swirl together. Give it a try! I love how the swirls turned out! 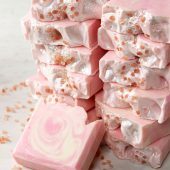 In making the meringue topping, does it ever harden to a very hard set? I made it as instructed above but substituted the scent with Relaxing fragrance. It hardens for a good cut, but is still semi-hard set. I’m afraid the entire meringue will disappear with one shower experience. Did I do something wrong? 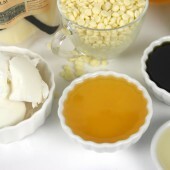 Meringue topping – we have a few on this blog. Which ones are you referring to? 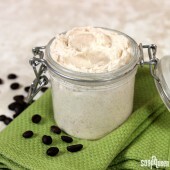 Or do you mean the whipped soap one from this recipe above? So cute! I was wondering…what is the texture like for the frosting? Does it get firm or is it kind of rubbery? Ty! Love the technique. 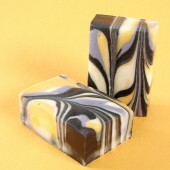 It will work great on my next project, Lemon Meringue Soap. Just one question, do you frost after unmolding the loaf? Love it! 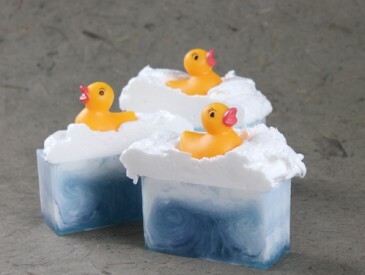 I use duckies and other toys in my soap, and this is just adorable! 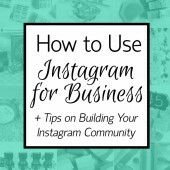 Thank you for sharing this wonderful idea! 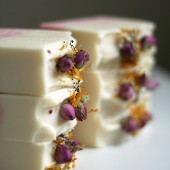 Adorable…and I too am a “soap dreamer”…some of my best ideas come to me while I am sleeping! 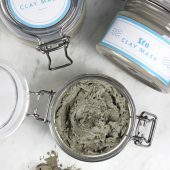 Love this project, can’t wait to try it! That is SO cute! 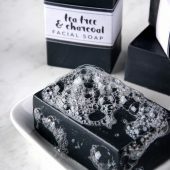 Can you do something like it for CP soap? 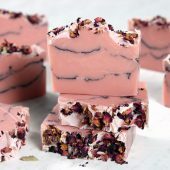 You totally could – I’d just add the ‘frosting’ layer right after you pour the soap so the two have a chance to fusee together. This is both beautiful AND adorable! 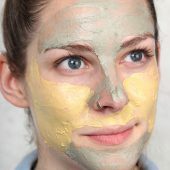 Yes, to answer your question, I have had many a soaping dream! Must make you a visionary! Love this and thank you so much!